This is one community that lives up to its name; with bright and spotless units, spacious screened lanai, and a desirable location that is conveniently close to the best dining and shopping experience, one can truly call this place Paradise Village. This complex has an inland view and with its low number of residences, your privacy and relaxation is guaranteed in this piece of island paradise. Monthly maintenance fees for Paradise Village condos is $433. The maintenance fee includes master insurance, cable TV, lawn maintenance, landscaping , manager , pest control , reserve , security , trash removal and water & sewer. Pets are allowed at Paradise Village. We allow one pet, up to 10 lbs. The minimum rental period in Paradise Village is 7 days. 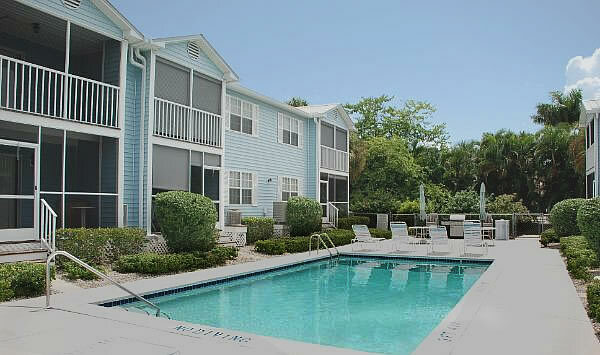 A perennial favorite, Paradise Village condos are very easy to rent all season long. There is only one, two-bedroom floor plan in Paradise Village. Click here to see all Paradise Village floor plans. Owners at Paradise Village enjoy restaurants, stores, beaches, and entertainment that are all within walking distance so if you’re not up for an active day, you can take an easy walk to the island's Movie Theater or just lounge or stroll along the coast. Either way, Paradise Village is a shining example of Marco Island Florida condos that lack nothing in making your vacation a truly memorable and relaxing experience.